Years ago, I taught our Kiki a formal recall using targeting. Systematically I proceeded to work through the exercise. Much to my delight, Kiki developed the most fantastic competition recall. People gasped at her speed and enthusiasm. Her formal recall never failed us over the years. You could say that it had behavioural momentum. Domjan, in The Principles of Learning and Behavior describes behavioural momentum as, “response persistence in extinction.” In non-technical language, behaviours with momentum are enthusiastic, despite distractions. They are highly resistant to extinction. Behavioural momentum is the Holy Grail of dog training. Behaviours with momentum are like boulders rolling down a hill. Considerable effort is required to stop them. By contrast, weak behaviours are like pebbles. The slightest bump in the road and they get derailed. Sluggish responses are an indication of poor behavioural momentum. Dogs that are easily distracted have poor momentum. When sniffing a blade of grass is more appealing than coming when called, recall behavioural momentum is low. If you wonder if your dog enjoys doing what you ask, then you might have a behavioural momentum issue. When owners ask for reliable manners, they are asking for behaviour momentum. They want a dog that walks politely and ignores squirrels. They want a dog that keeps four paws on the ground, even when visitors approach. They want fast, immediate recalls. People want solid, reliable, strong behaviours they can count on. There is no magic. 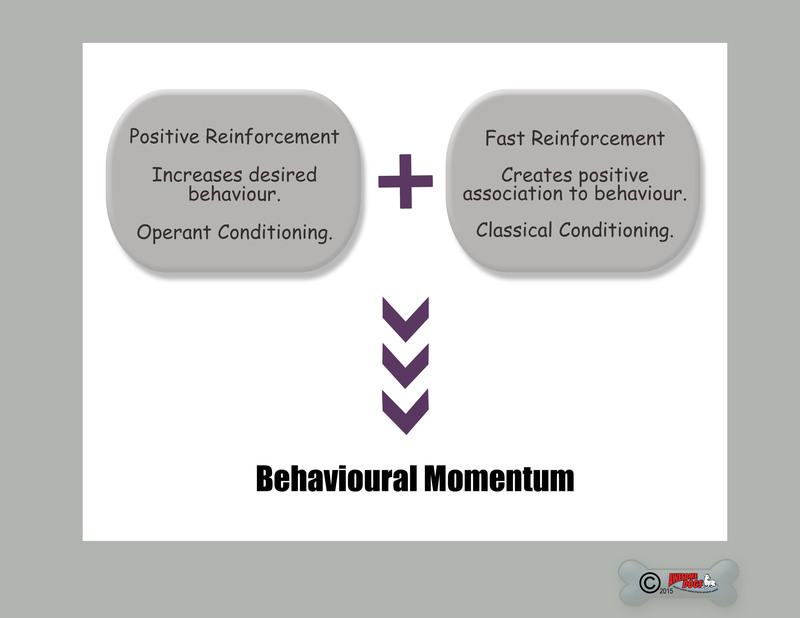 Behavioural momentum combines operant and classical conditioning. Pavlov might always be on your shoulder. For too many, he’s snoozing, periodically waking to create an unexpected association here or there. We forget about him and he dozes off again. Wake him up. Intentionally create behavioural momentum by using a fast rate of reinforcement. Crazy fast reinforcement triggers two types of learning. The dog learns the skill through positive reinforcement. The fast reinforcement creates a positive association to the behaviour. When dogs love executing learned skills, distractions are less tempting. That is crazy powerful stuff. How fast is fast? The following video shows my Karma working with a high speed of reinforcement. A reasonable goal for initial training is ten reinforcements per minute (or about a third of the reps in the video.) Reinforcements should come quickly enough that the space between repetitions is devoid of wanderitis. Slow reinforcement tanks momentum. The temptation to prove that we can quickly wean away from “treats” can lead to slow reinforcements. We employ a litany of protocols, “real life” reinforcements, games, variable reinforcement schedules and Premack. While there is nothing wrong with some of these things some of the time, they are slow reinforcements. Sluggish, sloppy outcomes tied to poor momentum convince people that positive reinforcement is not reliable or effective. There’s a real tragic irony in there. Tactics that we use to convince people to use positive reinforcement may slow reinforcement, sabotaging reliability and enthusiasm. Weak results convince people that positive reinforcement did not work well enough. Aversives can trickle back into the dog’s training. Creating behavioural momentum is the trainer’s choice to use food to its full potential. We can choose to decide, today, that we will not only teach behaviours, we will teach so the dog loves doing them. We owe the dogs that. If we create behavioural momentum, there will be no doubt in our mind that the dog wants to do the things we ask of them. There is no greater feeling than knowing you have reliable behaviour from a happy dog. It really is a Holy Grail worth pursuing. Wake Pavlov up and get him to work. He is not just a tag-a-long. Previous Previous post: Reading Research: Does Size Matter? LOL. Literally, Because this method DOES very much rely on having a dog that takes boring food immediately and eats it straight away. My German Shepherds, take the food, then put it down to check what it is. If it comes up to expectation they might then decide to eat it. I had one dog though who waited till I wasn’t looking and then dropped it. One Kelpie I had used to spit even nice food (roast heart) back out at me — I had to teach him to TAKE food “treats” — by not throwing his ball until he had actually swallowed the treat. Even then , three treats in a row was is limit! 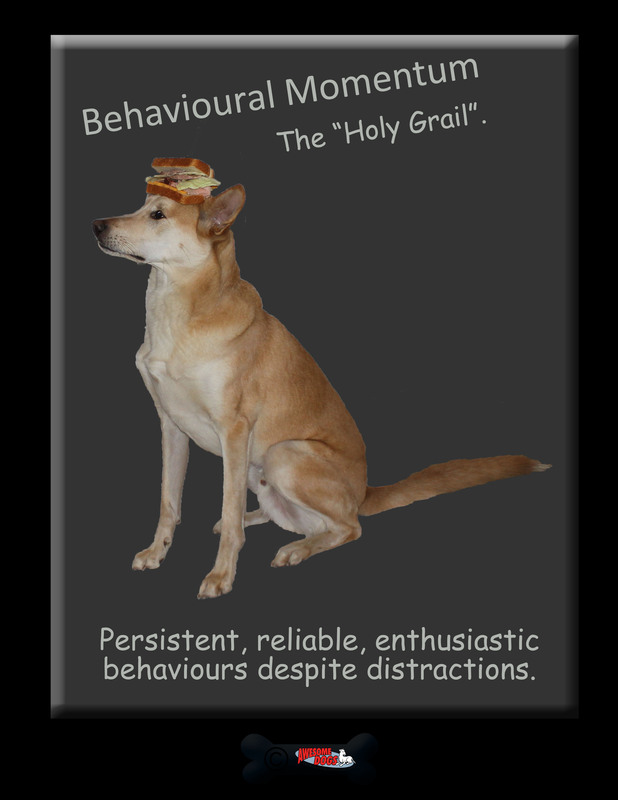 While it might be reasonable to call behavioral momentum the holy grail of dog training, I disagree with much of the rest. As simply a measured characteristic, behavioral momentum cannot be said to combine operant and classical conditioning as you stated. Either one alone, or simply traumatic learning may result in behavioral momentum, and the cause is not part of the definition. While I agree with your quote from Domjan, that’s not the entire picture. In Behavior Analysis and Learning, Pierce et. al. 2013, he notes Nevin but gives more information on the effect of various schedules. He shows that in some cases resistance to change (behavioral momentum) is opposite to the findings for rate of response. Also, we know that both high repetition rates and habituated actions promote both learning and behavioral momentum, and that this may happen with only occasional reinforcement (e.g. incidental learning). And if slow reinforcement tanks momentum as you said, how could you ever stop giving treats? Still, I do agree that a fast rate of reinforcement (together with a high repetition rate) promotes the formation of behavioral momentum. And that one should not quickly “wean away from treats”. And that most common arguments against positive reinforcement are lacking. So, I agree that your actual suggestions do have good value. However, after initial conditioning I often put aside the treats, as they slow things down, with other reinforcers much faster when seeking rapid response and momentum. Yes, for many food is the most convenient, but if his actions are 20 yards away, or behaviors with other dogs, food rewards are slow and clumsy. And, positive reinforcement is not itself a panacea, and is very inefficient for certain behavioral conditioning, simply based on its definition against some conditioning scenarios. There is no magic wand here. I would never presume to offer my own opinion on matters that researchers in the study of conditioning have researched. To quote from “The Principles of Learning and Behavior – Bomjan,”…. I’m not sure about the jump between rate of responding to rate of reinforcement. Those are two entirely different things. As stated above, if you give me the citation I’ll certainly read it. As for distance early in training. That would be a different matter altogether. When creating behaviours, you’ll want to increase criteria one at a time. I’m not sure why anyone would need great distance and a toy if the dog cannot do it close by. Like with most skills, accuracy comes before speed, otherwise you’re trying to control an accident waiting to happen. (Metaphorically speaking.) Speed comes after skill building. Toys add an element of speed that is premature if accuracy is absent. Don’t get me wrong, I use a lot of toys. But not when the act of chasing and playing slows the ROR. With food, high ROR is easy. There are of course times in dog/dog interaction when more social contact would be an excellent reinforcement. By that point, the dog knows some semblance of the skill. The reinforcement is switched out to one that is more convenient or purposeful. I’m not saying food is the ONLY reinforcement. No other reinforcements allow for the same speed of consumption and a calm, thoughtful and accurate skill building session like food. I can agree with most of that. Having taught obedience for years and watching human behavior all my life, I would say that “Good Timing” is an essential quality. You have to be a good dancer! Most people do not know how to express enthusiasm. I used to have my students practice out loud, joyous enthusiasm! When they mastered that ( and the embarrassment faded), they soon began communicating much better and openly with their animal!